Welcome to February, month of the Picture Book Marathon! 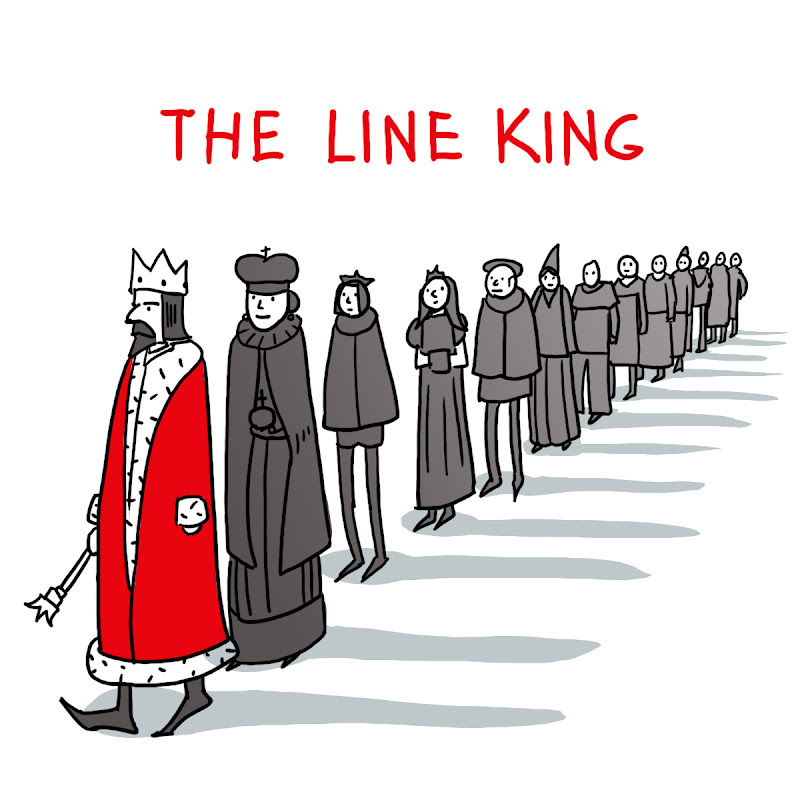 This story is about a little guy who's first in line, so he's the king. He's followed by the Line Queen, the Line Prince, all the way down through the kingdom. They go on an adventure, all in a line. 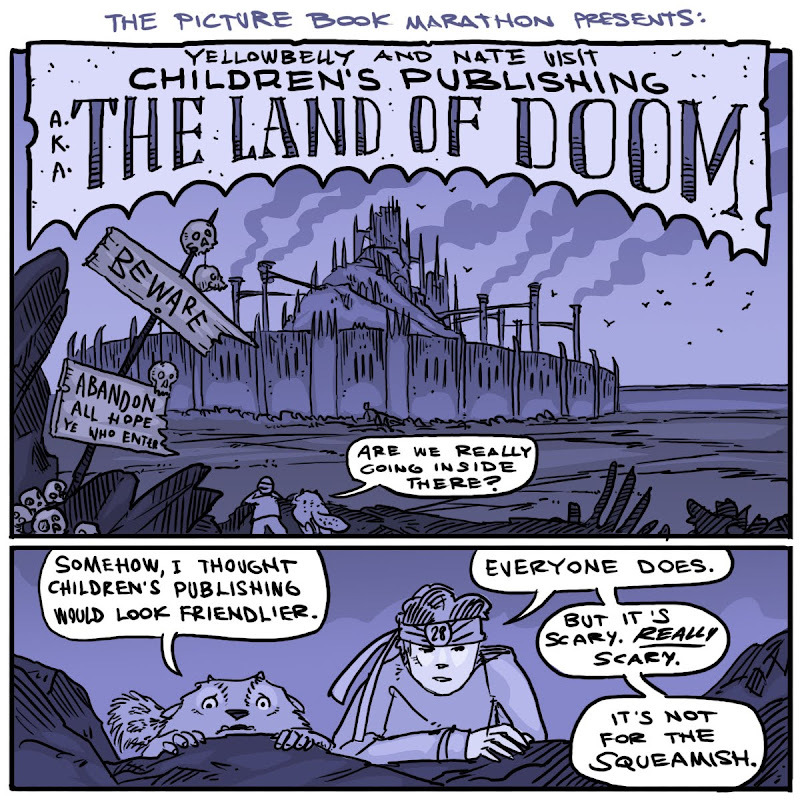 I'll be honest here, I got caught up in the LAND OF DOOM story, and totally neglected thinking about day 1's picture book. So...kind of a weak idea to kick off the first day with, but I wrote the whole thing down, and I like the title. Day 1-down! STARTING THE AVATAR FASHION SHOW!!!! Thanks a ton, Nate. I love mine. Also, I hope you and Yellowbelly have Plum on a headset somewhere in case you need backup. This looks like it could get ugly. The Line King has a lovely fairy tale feel about it. It also seems a bit like playing the card game Scum. Either way it is worth fleshing out. Want to know who doesn't find the children’s publishing world desolate and doom ridden - mediocre celebrities. Try and get your picture in the tabloids and you’re in. Chris: what a jaunty look. You already have the first one done?! Yowsa. It sounds like a great idea! Any dancing or teachable moments in there? I love the reference to Dante in the comic! I think there is a children's publishing book out there called, "It's a bunny eat bunny world." or something like that. Very brave of you to venture in. Okay, I can tell already this month is going to be INTENSE! I may not always have time to reply to comments--but these are all so great, I have to reply. Chris: Yes, many avatars have gone out. I should have mentioned that. They are trickling out here and there. Chris may have the most complicated one (so far, anyway) he wanted to be riding a sea turtle. Plum on a headset? Dang, why didn't I think of that!? Know what, I may steal that. I really might. DaNae: Thanks, I like it more today than I did last night. I pounded out several hundred words of manuscript for it, but the story doesn't quite live up to the premise. Also, it is no coincidence that my daughter was watching THE LION KING yesterday...and trust me, we'll get to celebrity books in the comic, just you wait. DavidM: Dancing? Oh, I get it, Line Dancing--haha love it! Tasha: My whole Land of Doom story is very much Dante's Inferno, but with a picture book allegory instead of, uh, hellfire and damnation. Nice catch. Laura: Another avatar sighting! I'm glad you like it! victoria: I'm going to track that book down right now, sounds great, thanks for the suggestion. Love that title! I thought of scum when I saw The Line King too, that and The 500 Hats of Bartholomew Cubbins. It looks like it could be a fun read. It's been so long since I've read Dante that I missed that reference. I thought you were entering Mordor. Dante's Inferno makes more sense. Suess is what I thought of when I saw the Line King too. The one about the cats who hold up each other's tails. I'm glad you're not giving away too much of your plot--it's a bunny eat bunny world and someone might steal your ideas. My favorite book about being a children's author is Author Day by Daniel Pinkwater, about doing school visits. Priceless. What if the Line King trips? Max says, "I like to look at the line of the line king." Shannon says, "Dude, can't have both the queen and the princess coming after their male counterparts in a line that establishes hierarchy. Ye shall have accusations of sexism thrown about! Agree with Jessica--Author's Day is unbelievably funny." Good idea...just watch out for Disney and all their rights lawyers. The sound of the title may throw them for a whirl. :-) Keep up the ideas. "Somehow I thought Children's Publishing would look friendlier." (P.S I made a trailer for Shannon Hale's Rapunzel's Revenge contest. Total props go to you and Dean too. Here's a link for your viewing pleasure). Love that picture. It looks like a British take on a mixture of the Five Chinese Brothers and Madeline. Sweet trailer Heather! That's amazing! And Jaime, at a quick glance, I thought you had written, "the Five Chinese Brothers take on Madeline." Which would be a pretty sweet story--my money's on the Brothers. Love the visual reference to Sam and Frodo camping outside the black gate of Mordor.